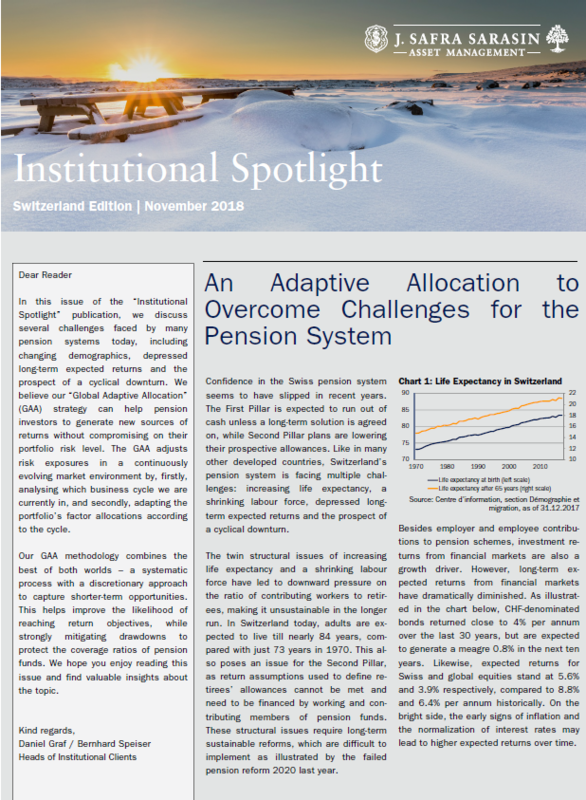 In this issue of the “Institutional Spotlight” publication, we discuss several challenges faced by many pension systems today, including changing demographics, depressed long-term expected returns and the prospect of a cyclical downturn. We believe our “Global Adaptive Allocation” (GAA) strategy can help pension investors to generate new sources of returns without compromising on their portfolio risk level. The GAA adjusts risk exposures in a continuously evolving market environment by, firstly, analysing which business cycle we are currently in, and secondly, adapting the portfolio’s factor allocations according to the cycle. Our GAA methodology combines the best of both worlds – a systematic process with a discretionary approach to capture shorter-term opportunities. This helps improve the likelihood of reaching return objectives, while strongly mitigating drawdowns to protect the coverage ratios of pension funds. We hope you enjoy reading this issue and find valuable insights about the topic. Interview - Caution, Disruption Ahead!